Last year the pound was negatively affected by ongoing concerns of a disorderly Brexit, and the future deal remains ever more unpredictable given the vote against PM May’s proposed deal on 15 January. Possible outcomes range from a No Deal Brexit, to a new Referendum that could reverse the whole process. The next milestone in the UK’s exit process will take place on the 29 January when MP’s vote again on Theresa May’s modified deal. If nothing changes, the default position could be for the UK to leave without a deal. In this uncertain environment it’s safe to say that we can expect more volatility with the pound whilst the deal is being negotiated. Unsurprisingly we have been contacted by many customers asking us how they could look to handle their current and future currency requirements. So, what can you do when thinking about what to do in the current environment? Quantify your risks against all possible outcomes, Hard and Soft Brexit. By understanding all of your options and the different types of impact each scenario could potentially have on the Pound, you can make better informed decisions. With little over 2 months to go until the deadline of 29th March, you have a better chance of securing the rate you are looking for sooner, rather than later. You should make your decision based on your individual situation and attitude to risk. 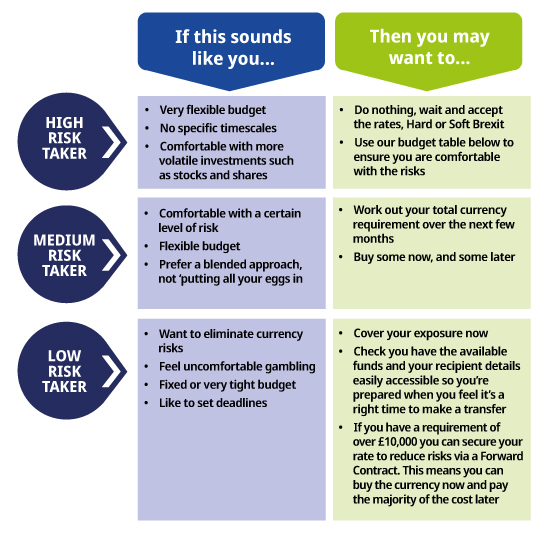 If you’re a medium or high risk taker, the budget table below could help you set some boundaries for your target rates. More importantly, you can set a backup plan to work out a minimum rate of exchange that you would be comfortable with. *Special Notes: The figure is based on the live mid-market rate, correct as of 09:00 on 23/01/2019, and are provided for indicative purposes only. Live mid-market rates are not available to consumers and are for informational purposes only. The rates we quote for money transfer can be selected via the page on our website ‘Live Money Transfer rates’. Nobody can predict for sure what will happen next, or how the UK will be impacted once a deal has, or has not, been reached. We can be your eyes and ears in the market with a range of currency tools to help you monitor market movements. With your XE account you can make transfers online 24/7, and set up rate alerts so that you can keep track of the market. Log in to your XE Money Transfer account. The information, materials, accompanying literature and documentation available on our internet site is for information purposes only and is not intended as a solicitation for funds or a recommendation to trade. XE its officers, employees and representatives accept no liability whatsoever for any loss or damages suffered through any act or omission taken as a result of reading or interpreting any of the above information. While we take reasonable care to keep the information on the website accurate and up to date, there may be occasions when this is not possible. Case Studies and articles are not intended to predict future moves in exchange rates or constitute advice. XE makes no representations, warranties, or assurances as to the accuracy or completeness of any information derived from third party sources. If you are in any doubt as to the suitability of any foreign exchange product that you are intending to purchase from XE, we recommend that you seek independent financial advice first.